"...a feature common to most drug ads: they leave you confused about the information," says Kate Pickert, a Time Magazine reporter and author of the article "Do Consumers Understand Drug Ads?" I'd say that that most drug ads leave me confused about how pharmaceutical companies view consumers and patients. 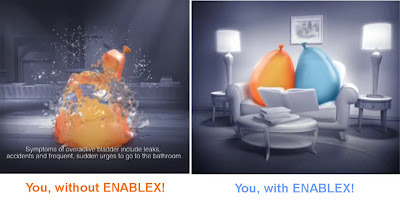 Take for example the cute ENABLEX TV ads that depict people as colorful urine-filled balloons. Is THAT how Novartis and P&G, marketers of ENABLEX, a treatment for overactive bladder, view people? This certainly does not leave me confused about what happens when you have overactive bladder! It takes me back to my youth in summer throwing water balloons at passersby. It also reminds me of a cartoon I did a long time ago for a health information booklet. It depicts how specialist physicians sometimes view patients' medical problems only through their narrow specialist perspective. "In many cases doctors can't exactly identify overactive bladder causes. Neurological disorders, such as Parkinson's disease or strokes, are often associated with overactive bladder. That last one is interesting: you may be taking one drug to counteract the symptoms of another! Nice post and a good point. "When you hear thundering hooves think horses not zebras" used to be the adage taught in med school. Yet with the exception of a few PCPs immune to 3rd party payer pressure, many physicians are so overwhelmed they don't have time to listen at all. Which I think in part explains the imagery used in the Enablex ads: they break through the visual clutter and demand to be heard. 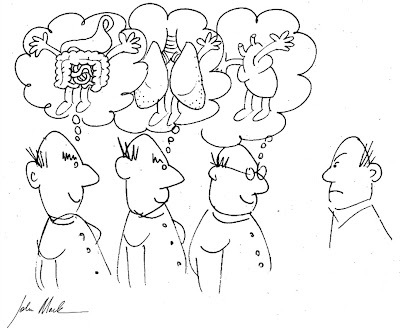 And while I don't personally suffer from OAB, I imagine the illustrations capture the feelings these patients might have. The problem with all DTC advertising is that it is interruptive marketing. It seeks to interrupt your activities and force you to pay attention. DTC is also a demand generator and nothing creates demand like hyperbole. Until messaging can be presented at time of diagnosis or first interest, pharma and their agencies will be forced to use these technique. The semiotics of woman in these ads, however, is an entirely different matter altogether!